The Clowning Around Team Building Workshop is designed to bring back to business a positivity that is both professional and fun. The program is delivered by ‘Peace-fool the clown’. 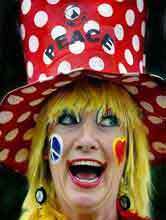 The clown is a powerful symbol of fun, equality, esteem and non judgement. Participants who enjoy where they work and feel free enough to share a good joke with colleagues are more likely to stay with the company. Susan aka Peacefull clowned with Patch Adams in Russia. This was a wonderful experience of clowning in hospitals, on the streets, in nursing homes and orphanages. Clowns have different personalities and each person can make up their own clown as they explore the silly part of themselves. Clowning is an ancient artform originally seen as the archetype which releases people from the structures of life and frees them through the levity of the human spirit. It sets them free to laugh and have fun together. Susan has clowned all over the world in places such as: Thailand, Cambodia, Vietnam, India, Egypt, UK, Ireland, USA, Costa Rica, Peru, Bolivia, Argentina, Chile, New Zealand and of course Russia with Dr. Patch Adams. Clowing releases joy and encourages play and letting go. It is fantastic in reducing stress and feeling fantastic. This program fosters humour, team building, de-masking and learning to see in another way . The humour promoted in this program is healthy and productive. After clowning around for 45 minutes your mood will change, as will your outlook on life. Let’s face it at times life is a joke and it is important to find the funny side and not take it all too seriously. Relaxation and visualization – happiness. Susan has had experience at the grass-roots level, having worked in over 300 organisations across most industries. She had the opportunity to observe first hand how employees were feeling and the pressures they were under. In addition, as a Manager and Analyst, she has also understood issues that Management face. In her Consulting role she undertook satisfaction surveys and gained deeper insights into views in the workplace.